It looks like people really do want a $99 Android-based hackable console. 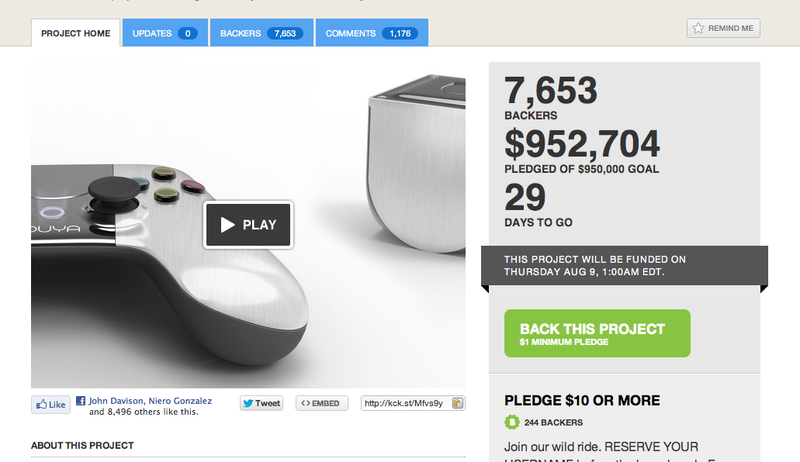 A Kickstarter crowd-funding campaign for the console that went live at 9am ET today has already hits its $950,000 goal. The Ouya console and controller are slated for a March 2013 release and, should they really be made and released, would comprise the first significant new home console to battle Nintendo, Sony and Microsoft in over a decade. It's worth noting that Ouya achieved this goal with the pledge support of just under 8,000 backers. While that proves there is enthusiasm for the machine, Ouya will likely have to have a much bigger userbase to entice game creators to make exclusive games or even exclusive variations of games for the Ouya system. Find out much more about Ouya, its promise and its potential pitfalls in our in-depth feature about the machine.